Runner up to the Guggenheim in the Webby Awards Cultural Institutions category, the SFMOMA, San Fransico Museum of Modern Art, web site shows some great online craft in the way they construct web exhibitions around single works, artists, and the context around both. 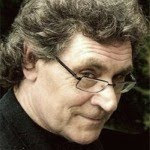 Though I struggle with the term, I have been especially drawn to their section 'interactive feature', which showcase an artist in the collection by way of small beautifully crafted online exhibitions with accompanying text and commentary from both their curators, the artist, and others who form part of the story. This one on William Kentridge is a good example of the quality. I also liked the one on Lee Millar from a year ago. Both would make an ideal Friday moment. "South African artist William Kentridge deals with subjects such as colonialism, apartheid, and AIDS in a manner that is as poetic as it is political, as universal as it is regional. Although he works in many media, he is perhaps best known for his series of stop-motion animated films, which are made by repeatedly erasing and reworking charcoal drawings. 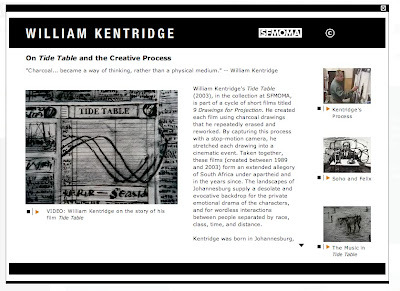 This interactive feature uses Kentridge's short film Tide Table (2003), which is in SFMOMA's collection, as an entry point to exploring the artist's subject matter and process." The additional takeout for me from these kinds of examples, is that great web design - craft and practice - isn't something that happens in the corner - but is an ongoing story which involves the whole institution going about it's daily practice. And being web based , we all get to learn how to keep doing good stuff! So thanks!